The very first Zero Government Blog featured Bradley Manning, who is accused of stealing a vast quantity of government documents and handing them to Wikileaks; and on Thursday his father Brian broke silence to protest his treatment in a government brig. Young Bradley, although innocent until proven guilty, is being kept in solitary 23 hours a day and may be depressed (who would not be?) and so suicidal. He has been deprived of clothes at night, lest he do himself a damage; hard to see what damage he could do himself with an elastic garter that the government is not already doing with its massive arsenal of psychological torture. So Bradley doesn't "follow any régime" - wonderful! Brian said that, deprived of night clothes, Bradley showed up for morning roll call in his birthday suit. And he joined the Army only because Daddy pushed him. Possibly Daddy will come to regret that. Meantime, having allegedly blown hundreds of thousands of whistles, young Brad is at the government's mercy; it has called him an enemy. So it is with two million others. 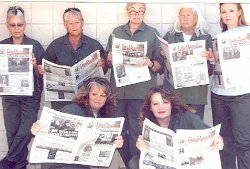 The photo shows seven of these "enemies of the state", taken for the Idaho Observer in 2007, imprisoned at the female federal pen in Phoenix, AZ. One grew on her farm 100 plants that the government had forbidden to be grown, even though Nature has been growing them for millennia with multiple benefits to our species. Another had been found to have evaded government theft of her money. Another may have committed investment fraud (and so, actually harmed someone.) Another had grown some marijuana, discovered after a warrantless government search. Another had been providing financial advice without a government license. And one had been helping Irwin Schiff publish the fact that no statute provides for the taxation of individual earnings. For most of these ladies, the prosecutor built a just-credible case and then offered a "plea bargain" of a few years in the Pen instead of a possible 20, 30 or 40 years if the accused went to trial and lost. Notice how dishevelled they look; neither their persons nor their hair are properly dressed - though they do, unlike Manning, at least have clothing. I know one of these ladies, and she is very good-looking, yet in the photo I can barely recognize her. Destruction of individual self-respect is the first thing that government tries to do, to people in its clutches. None of those two million will be behind bars in the coming zero government society. More than half of them have done no harm; those who have, will be made to restitute those they harmed; a very few of them, who are repeat aggressors, will be constrained in some way such as by house arrest or electronic bracelets. $60 billion a year will be saved directly by not incarcerating these people, and as much again will be generated by the productive work they do in the free society, the whole of which will be enriched as a result. And just possibly the army of prison guards, once re-trained so as to become employable in the market, will also contribute a few billion to society's wealth.